By the time he died in 1993 at the age of 73, Irving Howe was one of the twentieth century's most important public thinkers. Deeply passionate, committed to social reform and secular Jewishness, ardently devoted to fiction and poetry, in love with baseball, music, and ballet, Howe wrote with such eloquence and lived with such conviction that his extraordinary work is now part of the canon of American social thought. In the first comprehensive biography of Howe's life, historian Gerald Sorin brings us close to this man who rose from Jewish immigrant poverty in the 1930s to become one of the most provocative intellectuals of our time. Known most widely for his award-winning book World of Our Fathers, a rich portrayal of the East European Jewish experience in New York, Howe also won acclaim for his prodigious output of illuminating essays on American culture and as an indefatigable promoter of democratic socialism as can be seen in the pages of Dissent, the journal he edited for nearly forty years. Deeply devoted to the ideal of democratic radicalism and true equality, Howe was constantly engaged in a struggle for decency and basic fairness in the face of social injustice. In the century of Auschwitz, the Gulag, and global inter-ethnic mass murder, it was difficult to sustain political certainties and take pride in one's humanity. To have lived a life of conviction and engagement in that era was a notable achievement. Irving Howe lived such a life and Gerald Sorin has done a masterful job of guiding us through it in all its passion and complexity. 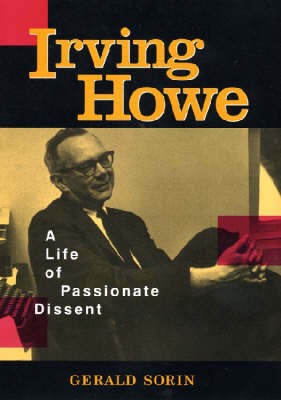 "Sorin does a solid and convincing job of chronicling Howe's life and times." "Irving Howe"s career, with its constantly shifting strands of political activism, literary commentary, and accessible Jewish scholarship, makes a great subject for an intellectual biography. Painstakingly researched and fluently written, Gerald Sorin's book strikes just the right balance between sympathetic identification and critical distance. Making excellent use of interviews, memoirs, and unpublished letters, Sorin recreates the many significant issues that engaged Howe. He brings considerable drama to Howe's gradual break with Marxist sectarianism, his shifting perspectives on socialism, his momentous reconnection to Jewish culture, his battles with the New Left, and the literary controversies that accompanied his steady growth as a subtle reader and vigorous, penetrating critic." "Gerald Sorin has written a lively and compelling biography of Irving Howe. A New York intellectual, Howe figured in most of the major and many of the minor debates of mid-twentieth-century America: socialism, modernism, Yiddish culture, civil rights, the new politics of postwar America, and the antiwar movement of the turbulent sixties. Howe spoke out forcefully and fearlessly, carving a place for intellectuals with moral vision. Sorin"s first biography deftly captures the complexity of the man and his eras." -Deborah Dash Moore,author of To the Golden Cities: Pursuing the American Jewish Dream in Miami and L.A.
"Irving Howe: A Life of Passionate Dissent offers such an intellectually detailed and conceptually animated account of Howe's work. Sorin did an excellent job." "What Sorin has accomplished in this beautifully written, balanced and probing intellectual biography is the most complete picture we have of Howe, a portrait of how one Jewish intellectual and activist struggled daily to balance scholarship and politics and the life of the mind and a life of action. . . . Sorin has ably captured the life and passion of this most unusual man, whose commitment to democracy is a legacy still worth cherishing."